Higher throughput is always desired by some manufacturers, but makers of size-reduction machines are tapping pent-up demand from smaller food companies, as well. Faster changeovers, greater precision, easier cleaning and sanitizing—the drivers of innovation in cutting and size-reduction machinery are similar to those in most other categories of food-processing equipment. Higher throughput capacity is another commonly heard refrain from food companies, and OEMs are always striving to accommodate that demand. But as globalization brings more processors into the mix, demand for smaller machines that deliver quality cuts also is rising, and suppliers are stepping in with downsized versions of their workhorse machines. "A couple of years ago, smaller food companies started asking us for more economical machines that could deliver the same quality cuts as our larger units," relates Tim O'Brien, vice president of sales at Urschel Laboratories Inc. in Valparaiso, Ind. The firm responded with the ETRS slicer and Sprint dicer, machines that feature the same performance but at lower throughputs than other slicers and dicers in the Urschel lineup. Similarly, Holac Maschinenbau GmbH rounded out its line of multipurpose dicers with the Cubix 100, a diminutive version of its larger units but with the same product features, such as a sealed loading chamber with easy-draining capabilities and hardened shear edges and product stabilizers. "Smaller runs and greater varieties of products are some of the trends we see," says Scott Scriven, senior vice president-sales and marketing at Robert Reiser & Co. Inc., the Canton, Mass., equipment supplier that represents Holac in the U.S. and Canada. "Customers are demanding versatile equipment that will allow them to produce a variety of different products." Of course, less isn't more for all processors, and OEMs also cater to high-volume firms' needs. The Affinity dicer, recipient of the outstanding innovation in cutting technology award at May's IFFA trade fair for meat processors in Frankfurt, Germany, exemplifies the more is more school of thought. It is the latest addition to a lineup of more than 40 slicing, dicing and milling machines from Urschel, an OEM that is enjoying strong growth. "Business is good when you're building a new 350,000 sq. ft. plant," O'Brien slyly notes, referring to the $80 million manufacturing facility the company expects to occupy in nearby Chesterton, Ind., in early 2015. "From a metal-polishing standpoint and the cleanliness of the food zone, it's an extremely sanitary machine, and changeovers are extremely quick," he says, but with two to three times the capacity as Urschel's standard dicer, Affinity is well suited to play the volume game. The 25 HP motor is augmented with a second, 5 HP motor that controls final cuts. The machine delivers a ¾ in. slice on the first cut and 1/8th to 2 inches on the second and third cuts. "The quality of the cut is as good as any machine Urschel has ever built," O'Brien adds, with the second motor ensuring positive outcomes with hard-to-cut materials. Holac dicers also come in a range of models and sizes to fit the production need. Quick-change cutting grids can accommodate portions ranging from 3-60 mm (1/8th to 2.4 inches) at production rates of 500 to 10,000 lbs. per hour. From manual to fully-automated operation, the machines can produce cubes for kebabs, strips for stir fry and shreds for salads and pizza toppings. "They are ideal for all kinds of fresh, cooked and tempered meat and poultry, as well as cheese, vegetables, fruits and fish," Reiser's Scriven says. Fewer is better when it comes to components, and Deville Technologies Inc. in Montreal, Canada, went from 50 components in the food-contact drum of its FS-40 cheese shredder to a single component. "Because it is one machined piece, there are no nooks and crannies where bacteria can grow," points out David Penta, Deville's business development manager. The machine can handle larger blocks of cheese than its predecessor, enabling dairies to do away with pre-cubers and freeing up valuable floor space. "The machine now is able to interface with an HMI, which in the past was not possible," Penta continues. That should provide greater repeatability and consistent output, particularly for cheese processors who must cope with variable texture, water content and block sizes that can affect outcomes. Variability is a natural occurrence with raw foods, and multiple technologies come into play if size-reduction systems are to produce accurate cuts and precise portions, without unacceptable giveaway. That's an outcome that processors big and small can appreciate. MRO Q&A: How do you properly clean a slicer? 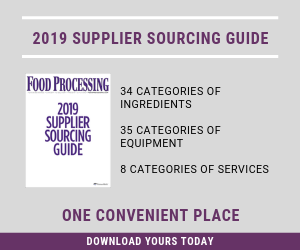 Food Processing's comprehensive list of the nation's leading manufacturing equipment suppliers.